to a charity of own choice. 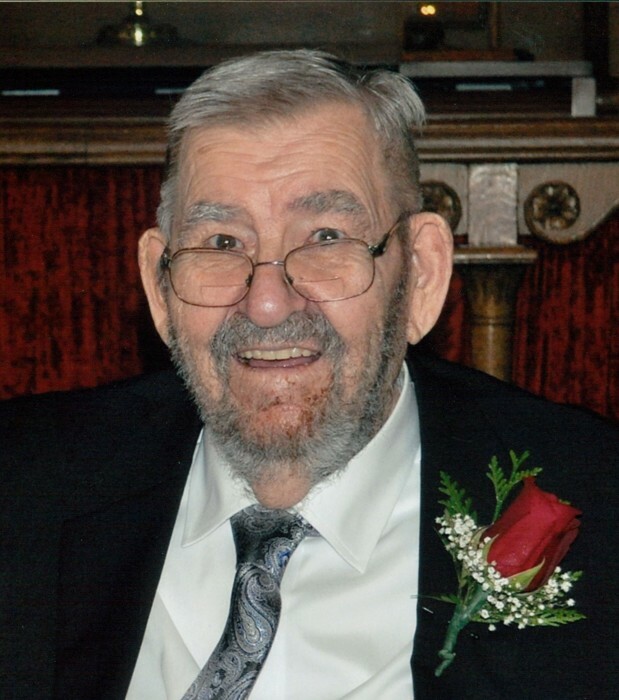 It is with sadness that the family of Hugh Charles Masson announces his passing on Monday, March 25, 2019 in Crystal City Manitoba at the age of 92. Hugh was born in Pilot Mound Manitoba on April 1, 1926 and returned to the family farm in at Wood Bay that spring. With the passing of his father that same year, the family returned to reside permanently in Pilot Mound. He told stories of walking the family cow into town for milking, and back out again in the morning. As well as the many many games of checkers he played with his mother. He served in WW II as a prison guard in Norther Ontario, and returned there several seasons after the war to work in the logging camps. In the fall of 1952 he met Neeltje (Nellie) Vanderstoel and were married April 25, 1953. Together they raised a family of six children. An entrepreneur at heart, he owned and operated Bennekon Seeds and Masson's Mobile Milling in Pilot Mound. The family moved to Baldur Manitoba in 1969 where he found the land to take on farming. In 1980 he moved again, to Barwick Ontario looking for new opportunities in farming. While there he took on the local cream route, collecting farmers cream weekly and delivering to a cheese plant in Manitoba. A busy work schedule resulted as he began to supply local business with product on his return trips. In 2009 he (finally) retired and moved to Fort Frances Ontario where he pursued his love of reading and tinkering in the shop. It was here in 2013 that Nellie passed away. In 2015 Hugh gave up the house and returned to Pilot Mound to reside in the Prairie View Lodge senior's center. While there he met, Earla McKellar (nee Scott) (of Clearwater), 70 years after having dated in their 20's. On December 31, 2016 they were wed and Hugh settled with Earla in her home in Crystal City. Here he remained happily until his passing. Through-out his life, Hugh believed strongly in volunteering. He was involved in bringing the Credit Union and the Library to Pilot Mound, the library to Baldur, Kidney Dialysis to Fort Frances, and the Scooter Storage Building to Prairie View Lodge in Pilot Mound. Hugh was predeceased by his first wife Neeltje (Nellie) (nee Vanderstoel) in 2013, his father Charles Masson and mother Edith Irene Masson (nee Kerfoot), brother Donald, son Cameron Scott that died in infancy, and his brother Harold Masson. Hugh will be missed by his wife Earla (McKellar), step children Melody McKellar (Ernest Bradshaw), Beausejour, Mb, Ross McKellar (Teresa Simpson) Oxford, Nova Scotia, Scott McKellar (Sheila), Winnipeg, Mb, Melora Side, Calgary, AB, Tammy Graham (Craig), Lac Du Bonnet, MB, children Donald (Diane) Masson, Prince George B.C., Brenda (Gordon) McLean, Brandon Manitoba, Eraine (Roman) Wegiel, Vermilion, AB, Eric ( Kasselle) Masson, Manila, Philippines, Bruce (Cheryl) Masson, Stratton, ON, Calvin (Jane Titley) Masson, Fort McLeod, AB. As well as 11 grandchildren, 14 great grandchildren and sisters Elizabeth Coates, Prince George B.C. and Marjorie Yeo, Winnipeg, MB,.